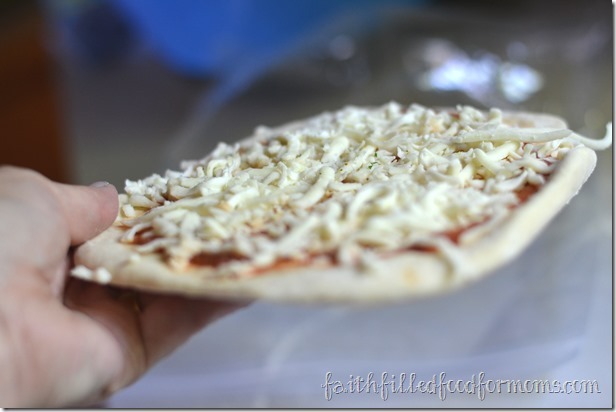 I have been making Frozen Personal Size Pizza With Homemade Dough like crazy this Summer! 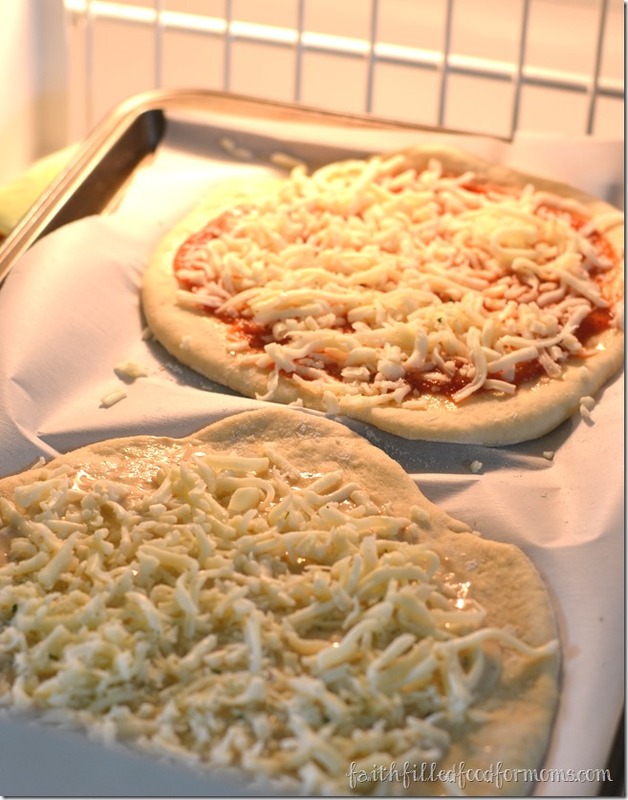 Every time I ask the kids what they want for a snack, for dinner, for lunch, for breakfast…the answer.. PIZZA! Oh my goodness..I was growing weary of making so much pizza! 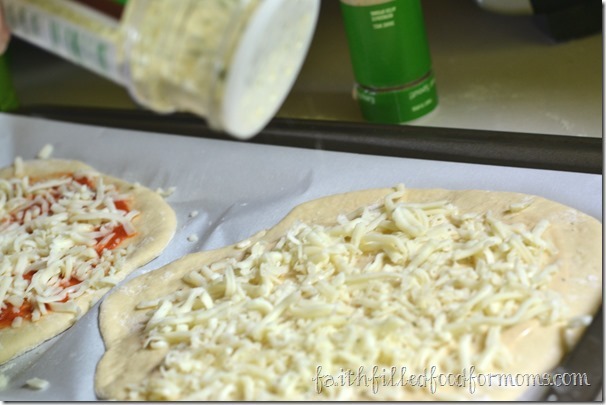 Luckily I have lots of different pizza recipes they love..this is just one kind you can make and it’s perfect for the kids! You know me..gotta find an easier way! So I started making this personal size pizza to freeze. That way they could take right of the freezer and just pop into the oven themselves. Even if your kids aren’t old enough to pop into the oven themselves, it still makes life MUCH easier for Mom. Awww that’s what we need right?! 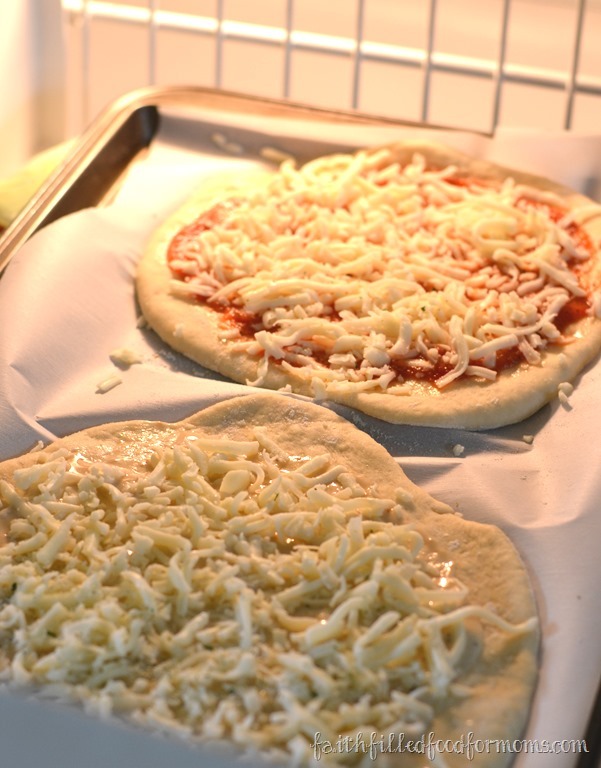 Then instead of rolling out a big ol pizza, make several individual size pizzas. Line a Cookie Sheet with Parchment Paper or Wax Paper and put 2 individual size Pizza Dough’s on them. Top with anything you would like. I used regular Red Sauce on one and Garlic Sauce on another, since those are the ones my kids like most. Then topped with Cheese only. You can top with whatever you like…meat (make sure it’s cooked! ), veggies..anything! 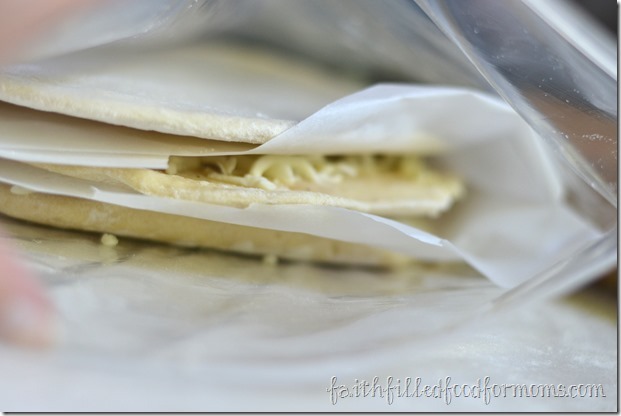 Now put into the freezer for about 20 – 30 min. with nothing on top. This is known as Flash Freezing. It makes for MUCH easier storage and packaging.. See how easy it is to handle the little pizza when they are individually frozen! Now cut up some Parchment Paper or Wax Paper into squares and layer the pizzas on top of one another with paper in between, put into a Large Freezer Bag. I also keep many of my personal size pizza dough plain because you can do more than just make pizza out of this dough! 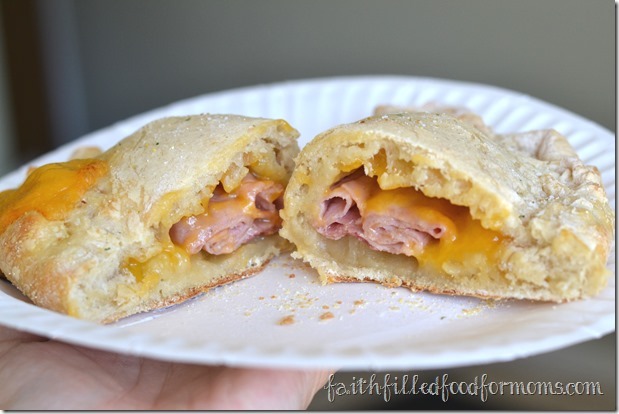 You can make Personal Hot Pockets, quick and easy! AND a super quick Mini Cinnamon Roll Dessert for an after lunch treat for the kids! Oh so easy! 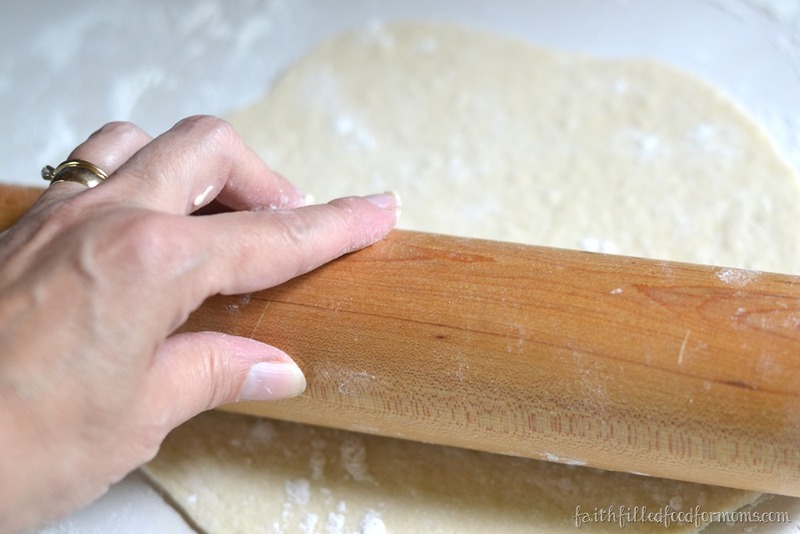 You could also make Homemade Cheesy Filled Breadsticks! Oh ya! We love homemade pizza, and I’ve been trying to figure out a way to freeze the dough so it’s not unwieldy to thaw & cook later on. 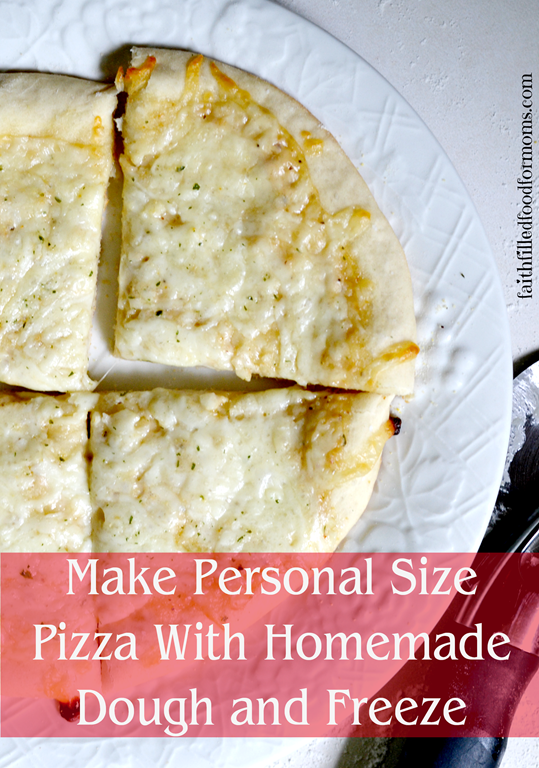 For some reason, I never thought of doing personal size pizzas! 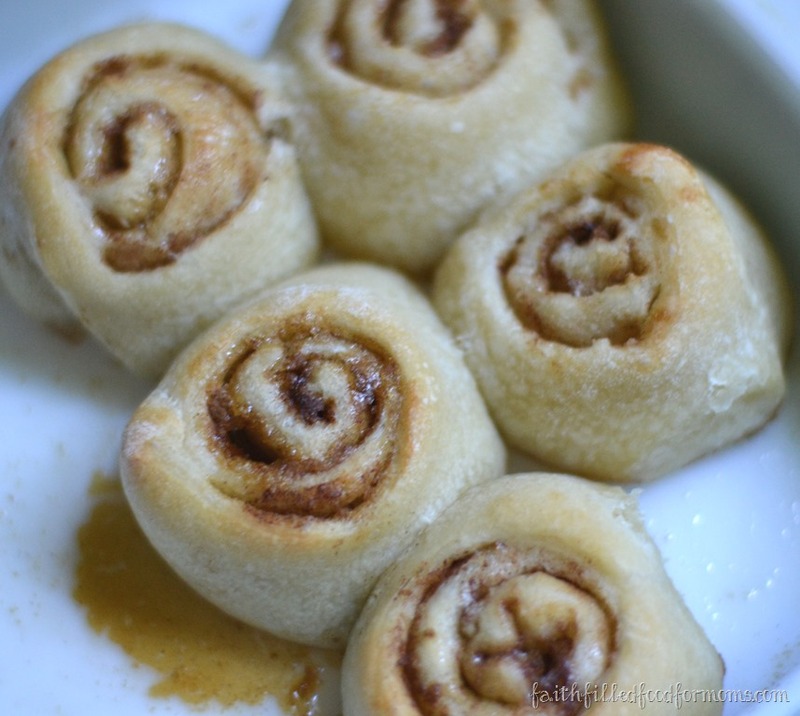 And I just LOVE the idea of using the dough for cinnamon rolls… great for that bedtime or early morning craving! 🙂 So glad I found you at Titus 2sdays! I have been looking for a quick and easy after school snack for my grandchildren. They will love this! I will be making these once I clean out my freezer. Perfect with school starting in a few weeks! And your method is a bit more frugal than the one I saw that recommended freezing them and storing them on cardboard cake rounds (ka-ching!). Hi there! 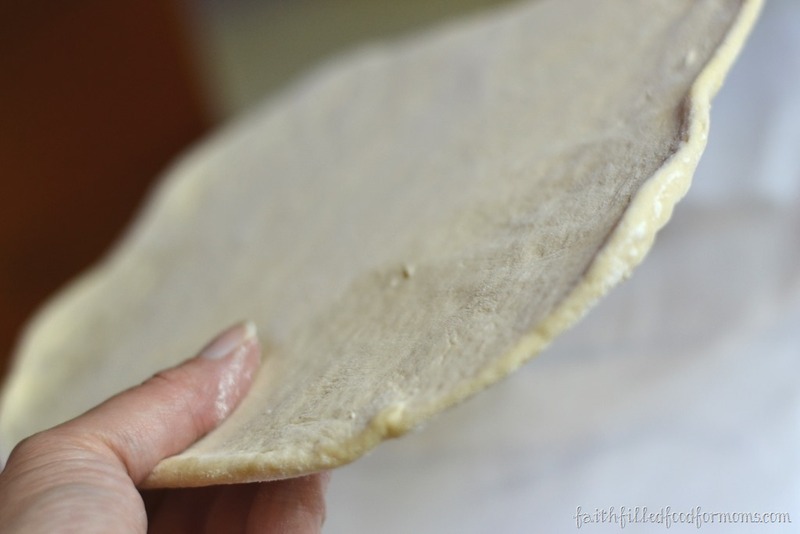 I have featured this recipe freezing idea on the Art of Home-Making Mondays this week 🙂 Thank you for sharing with us! Thank you so much Jes! I’m totally honored! Have a blessed week! I am adding this to my plan for prepping for back to (home)school. I need all the pre-prep and easy meals I can get. What a great idea! We love pizza and this beats buying frozen. I love pizza and personal size is perfect for the kids. Thanks! 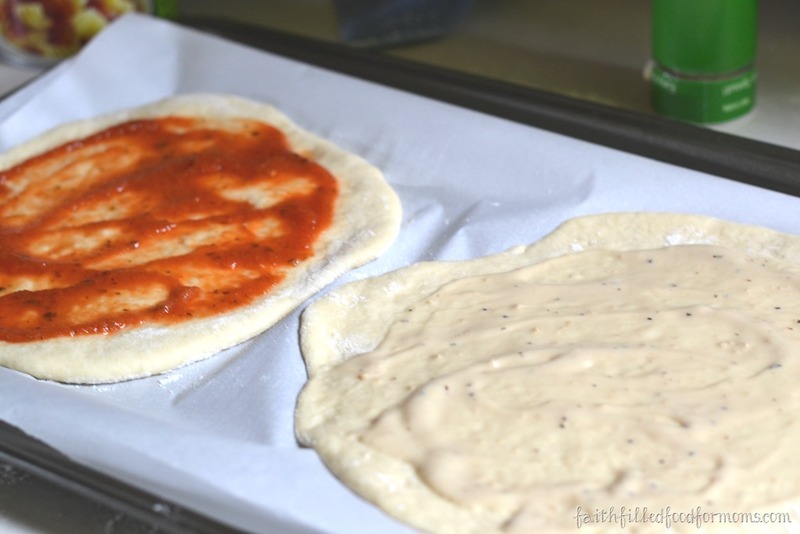 I have been wanting to freeze pizzas and was unsure about how to do it. Thanks so much for the tips! You are welcome Lindsay! Blessings to you!